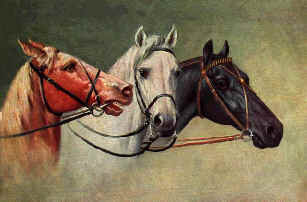 The Howden Horse Fair in Georgian times was quoted in The Sporting Magazine in 1807 as being the largest fair for horses in the Kingdom. Held in September the fair attracted all the principle horse dealers from every part of the United Kingdom. Each night as many as 2,000 horses were stabled in the Inn stables or sent out to grass. Stables in villages up to a 10 mile radius of Howden were also filled. It was estimated that 4,000 horses each day were displayed for sale, 16,000 being disposed of at the last fair, worth altogether not less than £200,000. Buyers from the military also attended the fair so it can be assumed that Wellington's Cavalry used horses bought at Howden in the Napoleonic Wars. Even the horses used in the famous Charge of the Light Brigade during the Crimean War were probably purchased at the Howden Horse Fair. In 1850 the Howden Horse fair is quoted 'as the largest horse fair in the world it is the grand depot for the supply of the army. A contract was made for 1,200 horses for the French cavalry,325 for light cavalry and £28 for for heavy troops'. By 1970 The Goole Times was reporting 'Even as recently as thirty years ago hundreds of people who brought thousands of horses and spent thousands of pounds visited the town every September for about a fortnight. Nowadays a stranger would not know that a fair existed. I attribute this disastrous change in the first place to the railways, secondly to electric trams, thirdly to agents scouring the country for horses, fourthly to advent of bicycles and motor-cars and chiefly to the numerous auctions marts for the sale of horses all over the country'. click to add your own content.